(Wikipedia tells me some of the authors he translated into Yiddish include Henry Lawson, Susannah Pritchard, Frank Dalby Davison, Alan Marshall and Vance Palmer). Held at the Kadimah Leo Fink Hall in Elsternwick, the launch was an impressive affair. MC was Renata Singer (wife of Peter Singer the philosopher and an author in her own right) and the speakers included Professor Bill Rubinstein and Arnold Zable, with readings of the story ‘Drummond St’ in both English and Yiddish. There was also a performance by the Melbourne Yiddish Choir. Louis de Vries from Hybrid Publishing told the extraordinary story of the book’s gestation. Although, as Professor Rubinstein had told us, these stories represent a distinctive moment in Jewish and Melbourne life, and although no less an authority than Nettie Palmer admired them, they have not been available as a collection in English until now. Two previous attempts to publish them were aborted when the publishers died unexpectedly, so de Vries was pleased to break the jinx! His stories are poignant and touching, featuring mainly Polish-Jewish protagonists who wrestle with the strange ways of their new home, but resonating for any migrants or refugees who have come to Australia. Often told with bitter irony, the stories express the loneliness and isolation of the immigrant, for whom cultural differences seem insurmountable, the longing for familiar Jewish life, and his sense of uprootedness and disappointment in his adopted homeland. (Preface by Serge Liberman. p.vii). I meant to listen respectfully during the Yiddish reading, but it was too hard to resist reading the first story. It’s called ‘Cain’ and it was all I could to suppress a tear as I read it. It takes the form of a letter to his family, from a Doctor Hermann Lowenstein who committed suicide in a Dresden concentration camp. He tells his wife Klara and his children not to say Kaddish (the Jewish mourning ritual) for him, because he will always bear the mark of Cain after he was forced by the Nazis to brutally beat another prisoner. From the moment that the Nazis broke into our house in the middle of the night and dragged me from my bed, my life has been suspended in a web of uncertainty. Suddenly, I began a new life. I became a new man. Dr Hermann Lowenstein ceased to exist. His books, his laboratories, his high moral principles and ideals disappeared without trace as if they had been sucked into a vacuum. A new being was created in my body – not a person, but a creation of fear that trembled at the sound of every scream, cowered before every stare, became a slave to every superior. My entire persona was ruled by only one thought – to live, to live, to live! (p.19-20). In his anguish, he tells them that because of this they must forget him and obliterate his memory without trace. But even in far-off Australia, Hulka’s laugh haunted him as, deep within him, still lived the terror of the Granadierstrasse. When he opened his restaurant in Rathdowne Street and saw for the first time the word ‘Jew’ scribbled in chalk, his heart missed a beat. Shamelessly, I also read the novella ‘The Last Minyan‘, a story which encapsulates Goldhar’s fear that his culture would be lost to assimilation. It’s very poignant too. It reminded me of those churches I’ve visited where the only worshippers are a pathetically small group of old ladies, and it’s not hard to see what will happen when they die out. As the speakers said, Goldhar died in 1947 so he did not live to see the postwar transformation of Jewish society in Melbourne, nor the establishment of the state of Israel. But despite his pessimism about the future of Jewish cultural life, they were quite sure that he would have been pleased to see that Yiddish, among many other aspects of lively Jewish culture, is thriving in Melbourne, and I am proud to live in a city that has transformed itself from an assimilationist monoculture to a city that welcomes all forms of diversity. 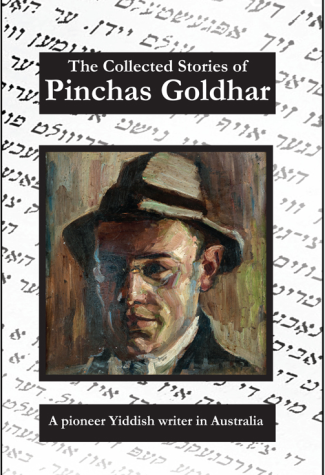 The stories are collected from various issues of the Australian Jewish News, Oystralier Leben, Dertzeilungen (1939), the Second Australian Yiddish Almanac (1943), Tsustayer Zamulbukh (1944) and Collected Writings (1949), over a period of time starting in 1931. They have been translated by Tania Bruce edited by Pam McLean, Judah Waten, Andrew Firestone, Joshua Goldhar, R.Z. Schreiber, and Naomi Kelly. The book also includes illustrations by Noel Counihan and Yosi Bergner, an Introduction by Pam McLean from Deakin University and an afterword by Pinchas Goldhar’s son, Joshua Goldhar. Update 24/8/18: See also this article at the Sydney Review of Books about Yiddish-Australian literature and the history of migrant writing in this country. Another wonderful review that enables us to not only understand the importance of the stories but enjoy the richness of the book launch – what an amazing experience you had – lucky you! For the majority of the population, I’d agree with “I am proud to live in a city that has transformed itself from an assimilationist monoculture to a city that welcomes all forms of diversity.” Let’s hope the voices of hate and division (and they appear to be increasing) don’t get too much air time and oxygen to do harm! Yes, so important children get access to these stories to initiate conversations and discussions so we don’t forget how easy it is to slip into darkness! Well, we do what we can to spread the word. I know that some tertiary institutions and schools link to this blog and its resources, so hopefully there are teachers out there who will be encouraged to buy a copy and introduce this great storyteller to their students. A great account of a very special event. You must never sleep! I took the book to bed with me, of course! Yes, Lisa, yesterday’s launch of Pinchas Goldhar’s book was indeed a cultural event, very much what its organisers had intended it to be, in addition to which I would add that it was a kind of bringing back to life of a writer, 70 years after his passing, whose stories, as Arnold Zable noted, speak to us in our day as they would have done to his readers in his own. Indeed yes, as a guest of Ros Collins, I was possibly the only non-Jewish person there and because I no longer live in Caulfield I don’t get an opportunity to hear the murmur of Yiddish in the streets as I did during my teenage years. It was such a pleasure to hear it again, and to understand the significance of it in the context of Goldhar’s life and work. I have read three more stories today (‘The Selling of Joseph’, ‘Off to Cheder’, and ‘In A Quiet Street’) but what also strikes me, as well as the literary qualities of the stories, is how the magazines the stories were printed in must have been so precious in those days, and how people must have looked forward to each new issue. Just as a side note, I first heard of Kadimah in its Carlton incarnation: I was helping my music teacher and concert pianist Valda Johnstone to write her memoirs when she was very elderly and in aged care, and so I had cause to research some of her memorabilia. She performed regularly at the Kadimah hall in Carlton and still had some of the programmes, which have now been donated to the State Library of Victoria. There was certainly a rich cultural life back then as well as now. My gosh, even just that excerpt from the ‘Café in Carlton’ story left me with a tear and a deep sigh. How to get the people who need to read these stories to read them? School reading lists, as you suggest. I have no doubt I will enjoy this collection (when I get back to some reading) and – of course – Hybrid Publishers have my vote (happy face). I must remember to add it to #TranslationThurs this week! Have you ever reviewed anything translated from Yiddish on your blog, Stu? So many languages in the world! I knew you would have, you are amazing! An excellent review as usual. Lucky for you the lights weren’t down, or can you read in the dark as well? For a ‘resolutely monocultural’ country we haven’t done so well! First the Catholic Irish, then the Chinese, then even before WWII, Italians and European Jews, then post-war migration from Europe, then post Vietnam War migration from Asia. Then we start acknowledging Indigenous Australians. Yes, I know there’s been resistance, especially to Chinese, and now Muslims – disgracefully whipped up by our so-called leaders, but hopefully it will die down again. All of which is not to say it must be painful to be a refugee. I like the authors he chose to translate into Yiddish, they are all very Australian.